So as I’ve written before, my home 4e game is dead, my players have moved on, and it seems that for the time being there’s no more D&D for us. So, without playing D&D, there’s not much I can write about D&D, right? Well, that’s true to an extent… I am still going to be DM’ing other stuff, and well, there are many lessons learned in running any type of game that I can learn and pass along to those of you that’ll stick with the blog. I know that many of you come here for 4e specific stuff, and well, I’m sorry but there may be a lull in that content. It doesn’t mean that I’m done gaming, no… far from. We are jumping head first unto Dragon Age, a system that I’m growing to like more and more. If you’ll join me on the Dragon Age ride, I’ll try to do with it what I did with 4e when I first launched this site over two years ago: help new DM’s out there with their games. I’ll be a Newbie DM all over again, exciting! I’ve also become a contributor at a Dragon Age site called “The Dragon Age Oracle“, so look for content there as well. There’s also a sporadic Star Wars Saga Edition game that I’m running every now and then, of which I’ll try to write a bit more about. Oh, and there’s a little thing in my head that won’t go away, a Star Wars conversion using the Dragon Age engine, which I think would be an awesome fit. Look for some initial thoughts on that soon. So yeah, a bit of new direction for the blog, but I’m excited. I hope you keep coming back for some of my stuff here. And this doesn’t mean that my 4e related stuff like Home Encounters is going anywhere, in fact, it’s getting even better as we speak. So while I’m sad that my 4e game has come to an end, I’m excited at the new direction my gaming is going in, and I hope you stick around. ← 4e: Easy to run, but is it as easy for players? I plan on reading pretty much anything you write at this point, man. I am huge fan of the Dragon Age system and in my humble opinion it is always a good thing to step away from D&D proper for short periods of time to take a look at new ideas and re-approach the game with fresh eyes. I am looking at possibly a Dragon Age game of my own or scratching this Cthulhu (run with Savage Worlds) itch. Thanks, Newbie. Glad to hear that HomeEncounters isn’t going anywhere. Who knows, maybe you’ll convert some of us to Dragon Age players. I am also struggling with keeping my 4E game going. I look forward to hearing about your explorations with the Dragon Age RPG as it looks interesting and I’m hoping I can convert some of my players to it. I agree with d20monkey. I never have liked 4e, but you know I read your blog from our conversations and whatnot. I find your information valuable, not only to someone who has just taken up the mantle of GMing, but someone like me who has been GMing for 15 years. There is always new things to learn, new perspectives to take in. I look forward to where your blog takes us Newbie! Keep it up! I’m very glad you won’t stop write here, Newbie! Also, I’m very excited too about the DragonAge help you’ll give us in next posts. Keep going with this excellent work, man! As an old DM I’m pleased to see you taking up different systems and exploring the role of DM from new perspectives for yourself. I might argue about rules etc on Twitter but that doesn’t mean I don’t endorse discovering new systems and exploring. It is amazing what tinkering with other games lets you bring to a favorite game, be it DnD or something else. I’m happy to see you’re sticking through, although I have enjoyed your content related to D&D 4e. Honestly, I think your group might be a little 4e burnt out. A shame since it seems you’re still up for playing or running but the group isn’t. I didn’t feel that 4e is too hard to grasp, but it seems like some people just rather play something a lot easier. I wonder if you might be interested in running a weekly MapTool game instead? I’m curious to see how that system works out when playing D&D or any Game. Would be neat if you could report on that or Wizards new online tool. I would love to jump into one of those games and see how it works, why it works and what it does. Seems like a great tool. Dragon Age: do it! I knew nothing specific about the game until I read your first posts about it, and while I have no plans of buying or running it, some of the aspects of the game (doubesl & their effects) interest me. Keep up the good work, now focused on DA. I’ve enjoyed reading your articles and following you on Twitter. I echo the sentiments of others here: I’m not going anywhere. I myself am venturing into the wider gaming world with a foray into L5R 4Ed. If Dragon Age turns out to be a compelling system, I’ll have to check it out too. My first question: Is it helpful to have played the video game before playing the RPG? I’m glad you will still be writing. The great thing about RPGs is that much of the DM advice isn’t system specific. I look forward to hearing how the Dragon Age RPG works out, it’s a great computer game so I’ll be interested to hear how your experiences running it as a RPG work out. I’ll also be paying attention to your Star Wars project. Granted I’m still very partial to the WEG release of the Star Wars RPG many years ago. It’ll be good to see you venture into other games. 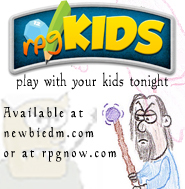 4e is great for new GMs. In fact, it’s basically built for them. If you’re to grow as a GM, and if your advice is to grow, then you’ll need a wider experience with more challenging systems. I look forward to the future of this blog. It’s always worthwhile to read your stuff, and as others have noted, good advice isn’t system-specific. I’m reading DA pretty closely to see if I can port my existing 4e game. I’m a little anxious about the next set of rules, as my players are level 5 right now, and I don’t want them to start over. Seems like there are a few balance issues with magic as well, but what system doesn’t have those? Good luck, and thanks for blogging! I look forward to hearing about DA – there are a lot of 4E blogs but not many talking about DA which is a game that certainly deserves more attention. I love Star Was as an RPG. Since I know nothing of Dragon Age, I’m definitely interested in your possible conversion. There seems to be some interest in this possible SW conversion. Dragon Age uses a simple mechanic, 3d6+modifier for all its rolls except damage. There are only 3 classes, and they are made unique through backgrounds, talents and specializations. So I think that SW can benefit a bit from this old schoolish game, d6 based like the WEG SW game, and be made faster and more cinematic using the quicker combat than the d20 version affords the game. So for example… 3 classes: Soldier, Scoundrel, and Noble. Then different backgrounds that let you pick which class you’d like to be…. I’ll also continue to keep reading — as noted before, good advice and critical reviews are rarely system-specific. On the subject of home encounters, though — it’s been 2 weeks since the last installment, at least from any machine I try to pull it on. I understand taking a break for holidays (and would have expected it for 12/30). Any idea on when encounter 1.6 will go up? That didn’t take long. So many giving up on 4e 3 years into it. Some of us saw this coming a mile away. For those of you that stuck with D&D just because it has 40 years, wake up. There is a new world order. It’s name is Pathfinder. You have to dip your toe in that pool before you decide that it’s too cold for you. I’m running 2 separate Pathfinder campaigns, and the players love it. I’ve pushed my chips all in, and am reaping the rewards for it. One good thing I can say about 4e, is that it brought me the Dungeon Tiles. I use them all the time in Pathfinder. Well, I didn’t move on to D&D 4e from 3rd, because I mostly skipped third. I didn’t like it. So going to Pathfinder knowing it’s based on a game I don’t like is hardly going to happen. We started playing Dragon Age and love it, so that’s where we are staying for a while. a tutorial sepcifically tailored to my needs. It was amazing.